Sooty, sulphurous, and malign: no woman should be out on a night like this. A spate of violent deaths – the details too foul to print – has horrified the capital and the smog-bound streets are deserted. But Rachel Savernake – the enigmatic daughter of a notorious hanging judge – is no ordinary woman. To Scotland Yard's embarrassment, she solved the Chorus Girl Murder, and now she's on the trail of another killer. Flint's pursuit of Rachel Savernake will draw him ever-deeper into a labyrinth of deception and corruption. Murder-by-murder, he'll be swept ever-closer to its dark heart – to that ancient place of execution, where it all began and where it will finally end: Gallows Court. As always, Edwards writes a book that grips you from page one. Immediately, you have a strange scenario where you question what exactly is going on. Is the guilty party really guilty? Are others involved to cover their tracks or are they really pillars of justice? As with the London fog that engulfs the city streets, Edwards swirls a fog around his characters so you are never sure which side of the law they are playing on. This method of smoke and mirrors is perfect for making one turn those pages faster than a speeding Phantom. Rachel Savernake is the lynchpin in all that is going on, a woman who works within the shadows. Rachel Savernake is no damsel in distress and can easily look after herself, so do not think for one moment being a woman makes her weak. You turn your back on her at your peril. Edwards scatters diary entries throughout his novel, but do they really give the truth about Rachel Savernake? Again, this makes the fog denser and difficult to see through, making my brain work hard to try and see the truth through the pea souper. Any author will tell a fledgling writer to read, read and read… and that is exactly what Edwards has done with his work with the British Library. He has immersed himself in the 30’s and 40’s, and by doing so has constructed a novel that could well have been written during that era, rather than ninety years later. The sounds and smells of London hit you and transport you back. ‘Gallows Court’ is no pastiche, but a homage to the glittering Golden Era. It felt as though Edwards was channelling Christie and Sayers as if these two giants had collaborated on a novel together. Here we have secret societies amongst high society, which brought to me the flavour of Christie’s, ‘Seven Dials Mystery’ alongside the wit and observation of Sayer’s eyes and mind. ‘Gallows Court’ is a brilliant read with an enigmatic heroine… or is she really so heroic??? 1) 'Gallows Court’ is your first Historical crime novel based in 1930’s London. Why did you decide to write your latest novel during this era? 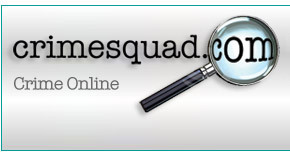 Is it to do with your work with the British Library Crime Classics series? 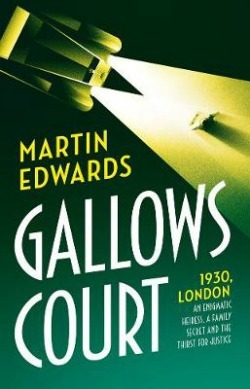 Did being immersed in crime novels from the 30’s and 40’s start the embers glowing for ‘Gallows Court’? Excellent deduction! You’re quite right; I am always keen to keep my writing fresh, and to try my hand at writing different types of crime fiction. After seven Lake District Mysteries, I was ready for a break, and a change of pace, as well as a change of place. Working on The Golden Age of Murder and the Crime Classics, and above all reading hundreds of books set in the 1930s for research and pleasure, has given me a great interest in that fascinating period of our history. But I didn’t want to write a conventional pastiche of the classic whodunit; there are already many writers who do that very well indeed. I set myself the challenge of trying to come up with an original concept, and writing it up differently. The result was a thriller, very fast-paced with lots of twist, and when I started work on it, I didn’t know how the story was going to end. So it was in every way a major departure from my earlier books and my usual method of writing crime fiction. 2) Your main protagonist is Rachel Savernake who is resourceful and mysterious in equal measure. In fact, she could be described as a dangerous woman. How did she come about in your imagination and why did you want to make Rachel the centre of ‘Gallows Court’? Rachel was the catalyst for the story. I had the idea for her as a character before I figured out any of the narrative. I even wrote a short story about her, just to test if I loved writing about her as much as I thought I would. And so it proved. I was very taken with this idea of a ruthless young woman, fabulously rich but with a strange and dark personal history, who arrives in London and becomes embroiled in a series of bizarre murders. What is she up to? As you say, she is dangerous; we see that as early as chapter one. The mystery of Rachel excited me and gripped me and simply wouldn’t let me go. 3) Jacob Flint is a young journalist from Leeds, now down in London to seek his fame and fortune and is currently sniffing around Rachel Savernake and her association with two heinous crimes. Both Rachel and Jacob are young, but totally poles apart. Why did you bring them together in ‘Gallows Court’? When the idea of the book was first swirling around in my mind, I realised that I needed a character who shared my fascination with Rachel, and wanted to find out what she was up to. Jacob can’t resist the temptation to play the detective. Once I started writing the story, it became clear that he would become a central character. I found myself liking him more and more, as he tries to make sense of a series of utterly bewildering, and sometimes terrifying, events. At times, it seems that Rachel’s on his side. But at other points, it’s clear that she’s playing her own game. And the question becomes – will he be allowed to live? 4) You have some wonderful names in your book, such as Jacob Flint and others like Leviticus Shoemaker. Did you have fun writing about these eccentric people? Absolutely. I very much liked the character of Shoemaker, London’s top private eye. I made him Jewish because one recurrent flaw of many Golden Age novels, including some by authors I admire, is that they stereotype Jewish characters. He’s not one of the main characters, but he does play an important part in the story, and I wanted to create a man who was three-dimensional and not a stereotype. He’s brilliant in many ways, yes, but frightened when it is reasonable to be frightened. As for Jacob, he’s a flawed guy, naive and a bit bumptious at times, but essentially a decent chap who finds himself completely out of his depth. I think he’s someone that readers of the book may like to identify with. 5) As mentioned in my previous question, for the past number of years you have been heavily involved with the British Library’s Crime Classics series with great success, bringing back into print authors such as George Bellairs, Anthony Berkeley, Anne Meredith and J. Jefferson Farjeon whose ‘Mystery in White’ was a big seller when published. Has it been satisfying to find these forgotten crime writers and how do you find these authors? Why do you think there is still such a voracious appetite with readers for these old classics? It’s been incredibly satisfying! I’ve found them mainly through a lifetime’s reading and searching, but sometimes I’ve benefited from good recommendations. I’m a long-time fan of Berkeley, but I came across Meredith’s ‘Portrait of a Murderer’ when I managed to find a copy she’d inscribed; I read it and was impressed. It’s a bleak book, but well written and quite powerful. Similarly, I found a copy of ‘The Arsenal Stadium Mystery’ signed by the players, and found it irresistible; it’s a fun mystery in the traditional manner. In the past, we had a very frustrating situation. Most of the old books (those by Agatha Christie being the obvious exceptions) had long been unavailable, and the few copies around were very rare and expensive. Critics had decided (usually without reading the books) that the books deserved to have disappeared, because they were mostly rubbish. Well, poor books have always been written and always will be, and there were certainly plenty of bad ones in the ‘good old days’. But my point has always been this – there were plenty of splendid ones, too, and it didn’t make any sense to regard them all as irrelevant in the 21st century. Many authors – Farjeon and Bellairs, for instance – were unpretentious entertainers; I make no wild claims for them, though they could and did tell a good story. A sizeable minority – including Berkeley and Meredith – were gifted writers, sometimes highly innovative. 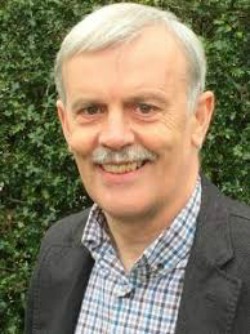 Richard Hull, Anthony Rolls, Julian Symons, and Raymond Postgate are other examples. Jorges Luis Borges, no less, liked Hull and Berkeley, and for good reason. There is genuine literary merit in some of these books, as well as pleasing entertainment in many more. Now that some of the books are widely available in well-presented editions, tens of thousands of readers are finding them interesting, varied, and hugely enjoyable. What more could a crime fan ask? 6) What is next in the pipeline for the writer, Martin Edwards? I’m working on a non-fiction project, and I’m also planning to write a sequel to 'Gallows Court'. As well as plenty more introductions to Crime Classics!